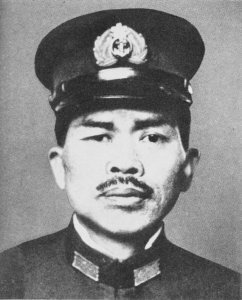 Ichimaru Toshinosuke (Ichimaru Rinosuke) was a famous naval pilot who walked with a limp from an old injury sustained in a test flight in 1926. By 1944 he was a rear admiral and commander of 27 Air Flotilla at Iwo Jima. With all his aircraft destroyed by American carrier raids, he put his 2300 men under command of the Army commander, Kuribayashi. Ichimaru disagreed with Kuribayashi's strategy of defense in depth, feeling his troops should either defend the beaches or concentrate around the Minamiburaki airfield complex; but he eventually built 300 pillboxes. By the time of the invasion, his force numbered 7,000. He led a final attack by 60 men on 18 March 1945 but somehow survived. He was finally killed leaving his cave on 27 March 1945. Ichimaru left behind a letter addressed to President Roosevelt seeking to justify the Japanese decision to go to war.